A storm has passed. Time to grab a camera and go to a beach. Not any beach though. There is a particular one that became my favorite for an unexpected reason. We all have travel guilty pleasures. Some satisfy their sweet tooth, others share every moment on Instagram. 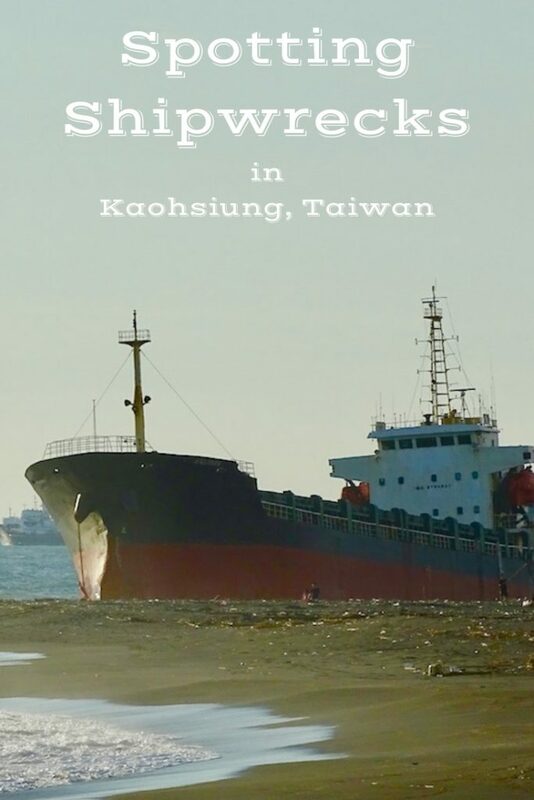 Since settling in Kaohsiung, the southern-most city of Taiwan, I acquired one too – shipwrecks spotting. You might smirk thinking “How is that a guilty pleasure?” After all, shipwrecks fascinated humanity for ages. Titanic immediately comes to mind or Vasa of Sweden. Last year, I saw the latter one in Stockholm and… well, let’s say I just walked by. I read about famous underwater recovery expeditions. 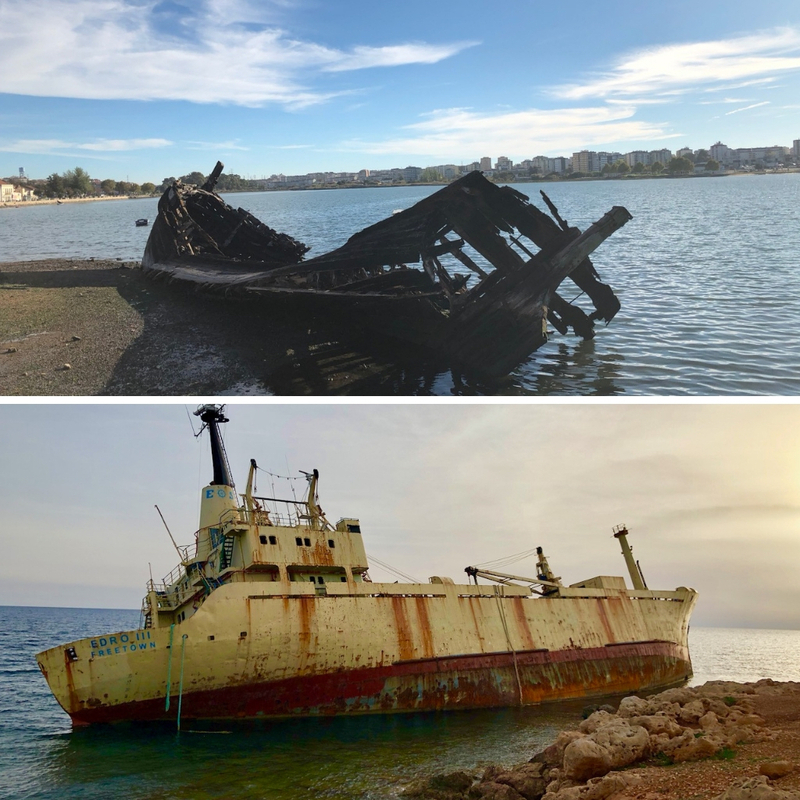 I saw some obscure shipwrecks. Hell, I even managed to scratch my foot over one. That was never my thing up until one day I took a stroll along the Cijin beach. At first sight, it was just a boat. There were a dozen others hanging around the entrance to Kaohsiung Port waiting for their turn to get in. Then, a rogue wave hit her. A poor thing produced a tormented noise similar to an injured animal – half a growl, half a raspy cry – while precariously leaning over a breakwater. It was a captivating moment. A mechanical beast, a soulless device howled in pain. She frantically wanted to sail away and, suddenly, I desperately wanted to help. There was a stark difference between this brand new shipwreck and all the others that I saw before. It looked so… real? Just a few days back, a crew lived on-board doing their jobs, eating, sleeping, making jokes… In a fit of temper, Poseidon (or whoever reigns the waters of the South China Sea) sealed their fate. They were fighting to save their boat in a rough sea, and they lost the battle. The older shipwrecks lack this vivacity and animation. 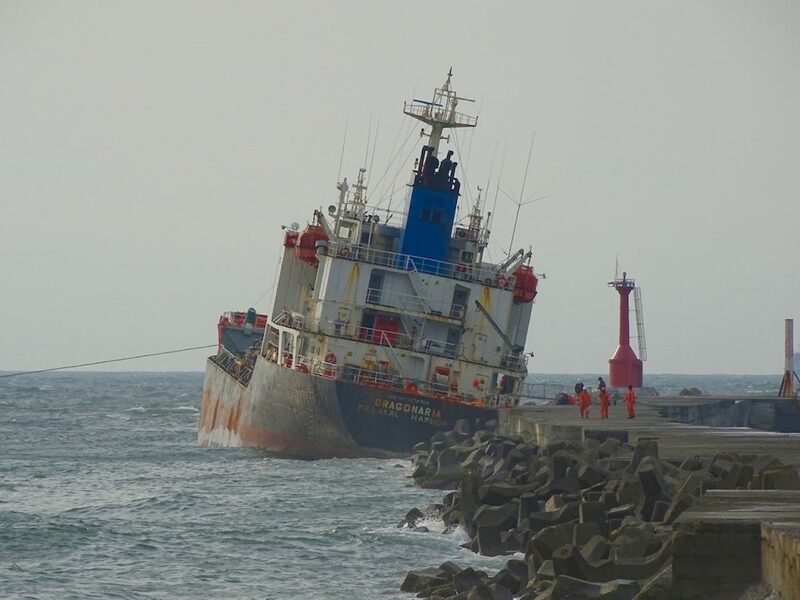 By the way, according to the local news, all crew members were rescued safely without any injuries. Aside from raw emotions, I was intrigued. I assumed that shipwrecks belong to the past. All modern gadgets and technology surely keep boats safe, perhaps even a bit boring. A shipwreck in the twenty-first century should be as rare as hen’s teeth. The only lame excuse for such an obvious mistake is that being a land creature, I never gave it a thought. A bit of online sleuthing left me speechless. 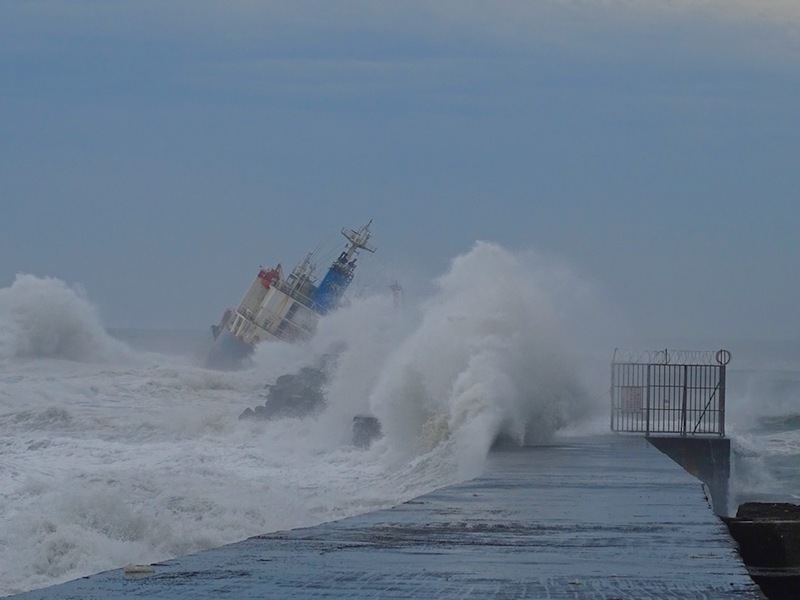 Apparently, a severe storm struck off the southwestern tip of Taiwan. 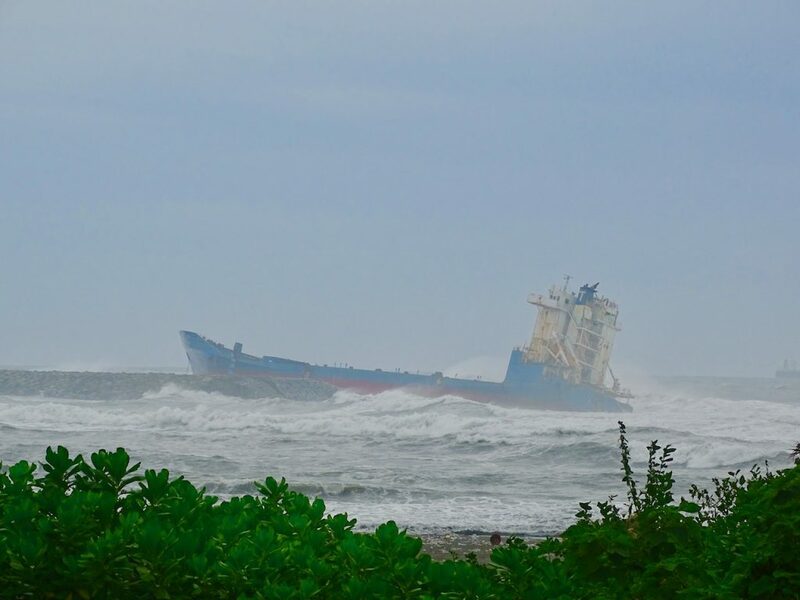 Heavy winds and strong waves battered the shoreline near the port of Kaohsiung. 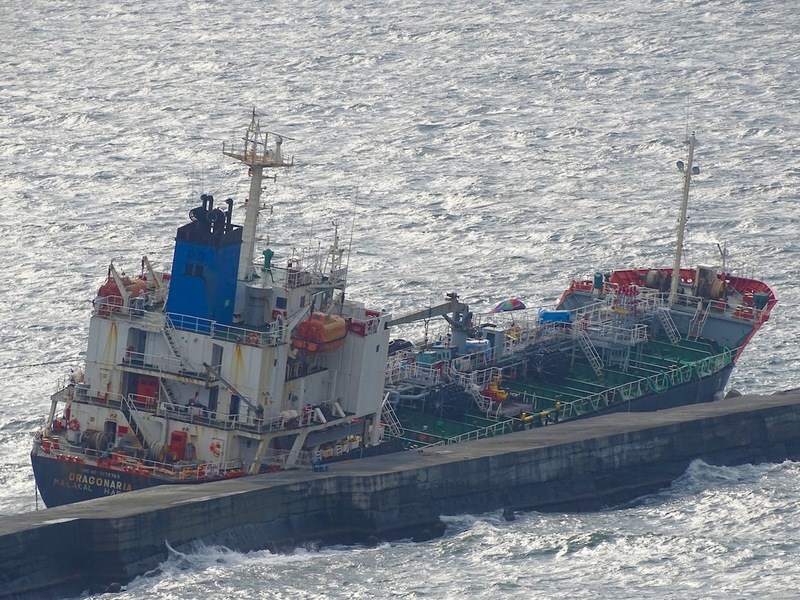 Seven vessels were blown ashore. Can you find three shipwrecks in this picture? Wow! 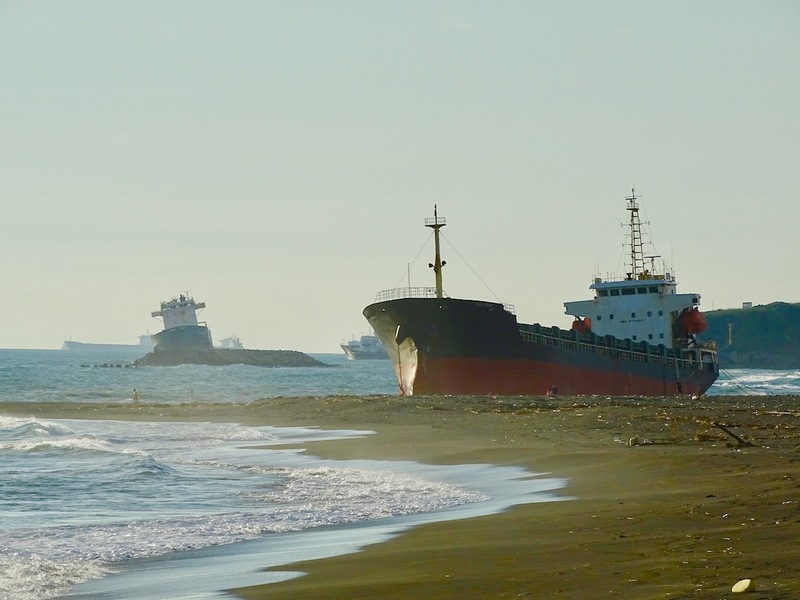 Not only my assumption was blown away, but there were six other shipwrecks somewhere nearby. It didn’t take long to find the second victim. 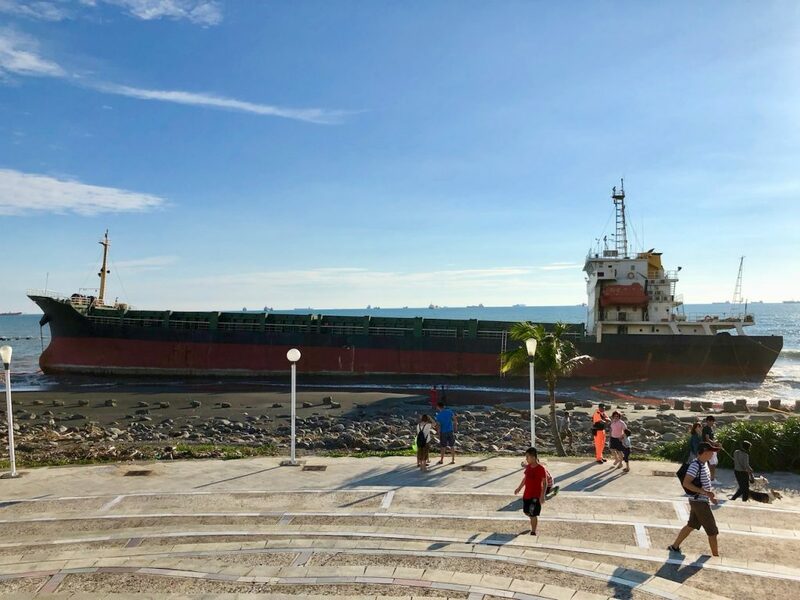 She managed to run aground right in front of the beach instantly becoming a new local attraction. Who can resist a selfie with a shipwreck? The third boat was full of activity when I spotted her for the first time. People in orange overalls busily moving up and down the ship reminded me of tireless bees buzzing around flowers. Why so much activity around? The fourth one was definitely a show-off among her peers. Poised and confident, she was sitting so close to the shore that I couldn’t help but imagine her purposefully posing for photographs. Where the remaining three are hiding, I haven’t figured out yet. I love this idea. I know there are sunken shipwrecks off the Carolina coast. I’d love to find just one, or maybe a Spanish dubloon. What a cool idea Elena. Makes sense too; with all the tough weather there I know shipwrecks abound.